Late style Parker Challenger from 1937 in black with gold plated trim. 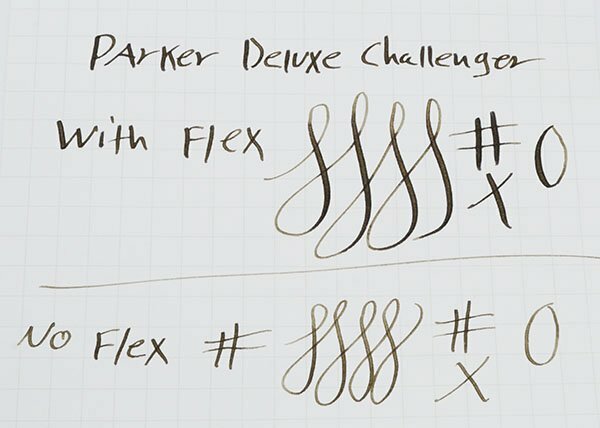 Fine-medium gold nib is semi-flexible. Button filling system is restored and working well. Very Nice condition. 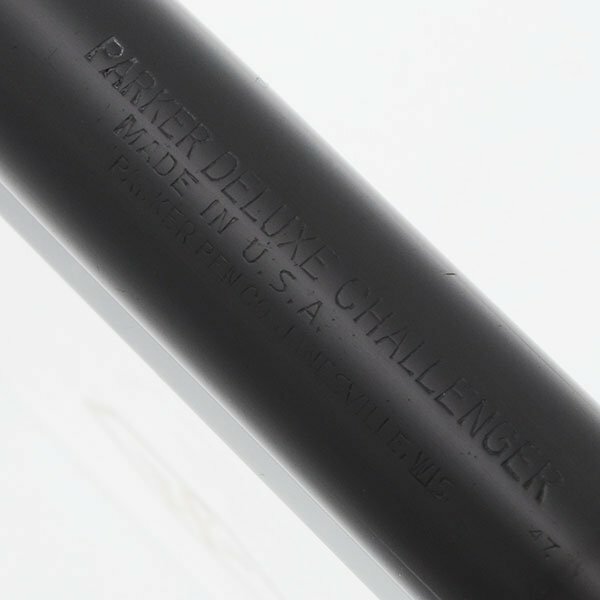 Product Name Parker Deluxe Challenger is labeled on the barrel but "Deluxe" generally refers to a triple cap band like this one has. Filling System Button filler. We've restored it with a new sac and it's working well. Color Black with a trio of narrow cap bands. The cap has a black jewel in it and the clip is the flat tapered one. The trim is gold filled. 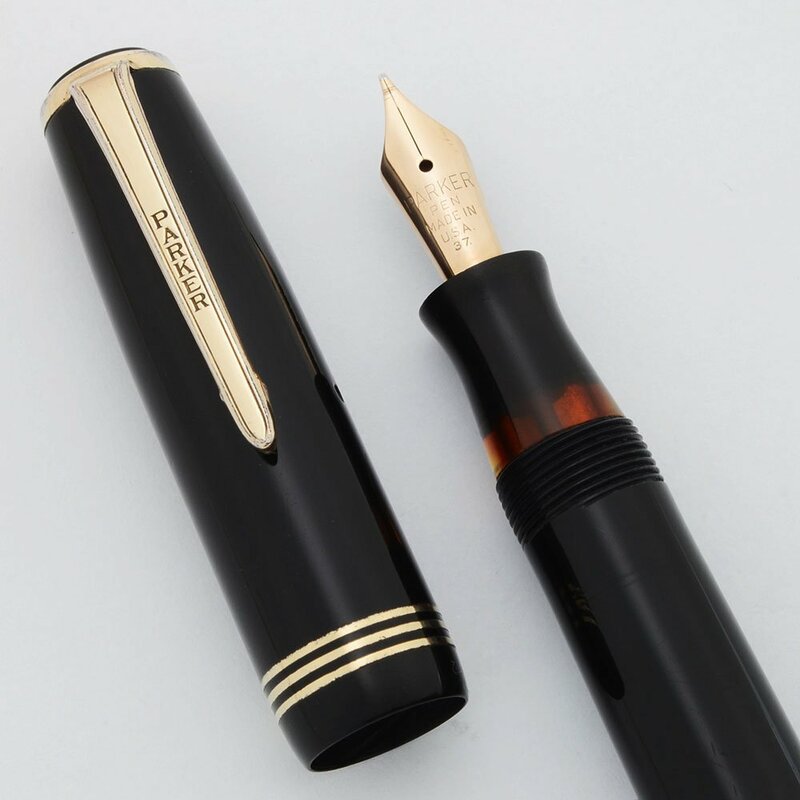 Nib FINE gold Parker Pen nib, marked with 37, indicating that it was made in the third quarter of 1937. It is springy and writes like a fine-medium with some flex. The nib has some scratches near the tip, but this does not affect the way it writes. See writing sample below. Condition Very nice condition. The trim is a bit worn with some brassing on the clip and the bands around the cap. The jewel on the cap has a small chip out of the edge. The nib has above-mentioned scratches. Barrel imprint is fairly clear but with some wear, and the barrel also shows minor capping and posting marks. No cracks, chips, or dents in the body of the pen. It's fully restored and working well. The viewing window is clear.